陈清敏, 郭岐明, 王强, 王喆, 高勇浩. 西秦岭秦岭梁环斑花岗岩锆石U-Pb年龄及地球化学特征[J]. 地质通报, 2019, 38(2-3): 213-222. 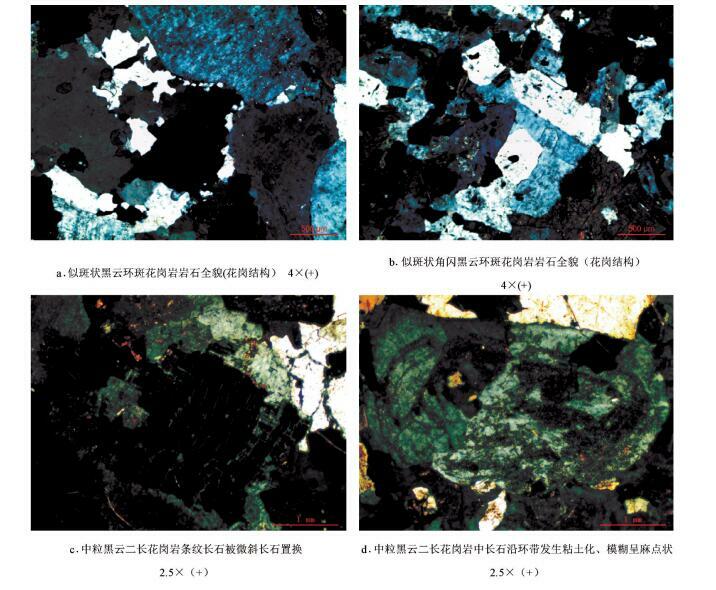 Chen Q M, Guo Q M, Wang Q, Wang Z, Gao Y H. Zircon U-Pb age and geochemical characteristics of Qinlingliang rapakiwi granite from Western Qinling orogenic belt in Shaanxi[J]. Geological Bulletin of China, 2019, 38(2-3): 213-222. Abstract: Based on geological, petrological and geochemical studies, the authors investigated Qinlingliang rapakiwi granite intrusion, porphyritic biotite rapakivi granite, porphyritic hornblende biotite rapakivi granite and medium-grained biotite monzonitic granite. LA-ICP-MS zircon U-Pb analysis suggests that Qinlingliang rapakiwi granite intrusion was formed in late Triassic(215.1±2.5Ma). Qinlingliang rapakiwi granite belongs to high-K calc-alkaline series with aluminous-peraluminous nature, and is characterized by enrichment of Rb, Th, K, Pb and Nd, depletion of Ba, Nb, Ta, La, P and Eu, and significant loss of Nb, Ta and P. In addition, this intrusion has moderate-low REE concentration and right-inclined distribution curve. The magma probably mainly originated from partial melting of the crust, and also had the characteristics of crust-mantle mixing. In combination with regional geological background, the authors hold that Qinlingliang rapakiwi granite intrusion probably originated from a post orogenic extension environment. 李先梓, 严阵, 卢欣祥. 秦岭-大别山花岗岩[M]. 北京: 地质出版社, 1993: 1-214. 王涛. 花岗岩混合成因研究及大陆动力学意义[J]. 岩石学报, 2000, 16(2): 161-168. 肖庆辉, 邢作云, 张星, 等. 当代花岗岩研究的几个重要前沿[J]. 地学前缘, 2003, 10(3): 222-229. 张国伟, 袁学诚, 张本仁, 等. 秦岭造山带与大陆动力学[M]. 北京: 科学出版社, 2001: 1-806. 张本仁, 骆庭川, 高山. 秦巴岩石圈构造及成矿规律地球化学研究[M]. 武汉: 中国地质大学出版社, 1994: 1-446. 张宏飞, 靳兰兰, 张利, 等. 西秦岭花岗岩类地球化学和Pb-SrNd同位素组成对基底性质及其构造属性的限制[J]. 中国科学(D辑), 2005, 35(10): 914-926. 张成立, 王晓霞, 王涛, 等. 东秦岭沙河湾岩体成因——来自锆石U-Pb定年及其Hf同位素的证据[J]. 西北大学学报(自然科学版), 2009, 39(3): 453-465. 弓虎军, 朱赖民, 孙博亚, 等. 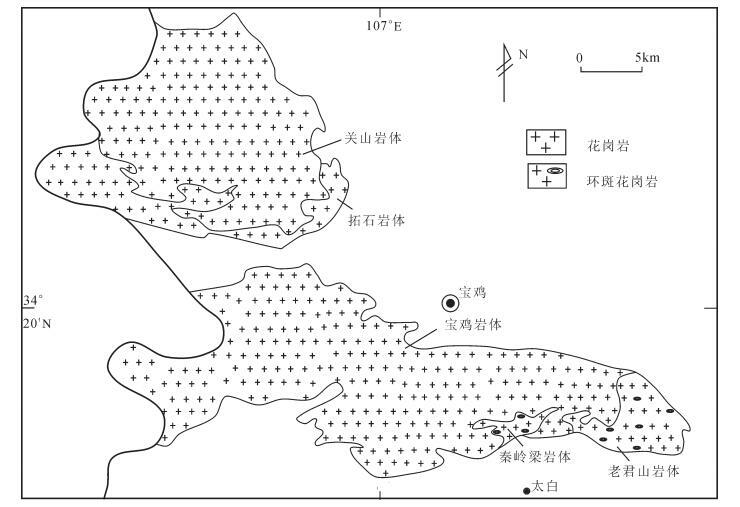 南秦岭地体东江口花岗岩及其基性包体的锆石U-Pb年龄和Hf同位素组成[J]. 岩石学报, 2009, 25(11): 337-350. Jiang Y H, Jin G D, Liao S Y, et al. Geochemical and Sr-Nd-Hf isotopic constraints on the origin of Late Triassic granitoids from the Qinling orogen, central China:Implications for a continental arc to continent-continent collision[J]. Lithos, 2010, 117(s1/4): 183-197. 刘春花, 吴才来, 郜源红, 等. 南秦岭麻池河乡和沙河湾花岗岩体锆石LA-ICP-MS U-Pb年代学及Lu-Hf同位素组成[J]. 地学前缘, 2013, 20(5): 36-56. 刘春花, 吴才来, 郜源红, 等. 南秦岭东江口、柞水和梨园堂花岗岩类锆石LA-ICP-MS U-Pb年代学与锆石Lu-Hf同位素组成[J]. 岩石学报, 2014, 30(8): 2402-2420. Rämö O T, Haapala I. One hundred years of rapakivi granite[J]. 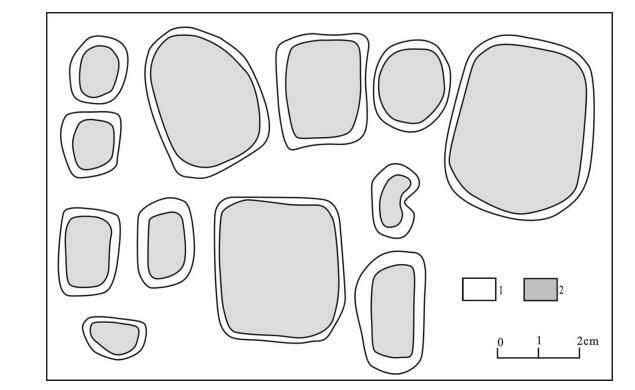 Mineralogy and Petrology, 1995, 52(3): 129-185. Haapala I, Rämö O T. Rapakivi granites and related rocks:an introduction[J]. Precambrian Research, 1999, 95(1/2): 1-7. 卢欣祥, 尉向东, 肖庆辉, 等. 秦岭环斑花岗岩的年代学研究及意义[J]. 高校地质学报, 1999, 5(4): 373-377. 张静, 陈衍景, 舒桂明, 等. 陕西西南部秦岭梁花岗岩体的矿物成分研究和相关问题讨论[J]. 中国科学(D辑), 2002, 2: 113-120. 王晓霞, 王涛, 卢欣祥, 等. 北秦岭老君山和秦岭梁环斑结构花岗岩及构造环境——一种可能的造山带型环斑花岗岩[J]. 岩石学报, 2003, 19(4): 650-660. Anderson T. Correction of common lead in U-Pb analyses that do not report 204Pb[J]. Chemical Geology, 2002, 192(1): 59-79. Ludwig, K R. User's Manual for Isoplot 3.00. A Geochronological Toolkit for Microsoft Excel[J]. Berkeley Geochronology Center, 2003, 1-70. Rapp R P. Heterogeneous source regions for Archean granitoids. [C]//Wit M J, Ashwal L D. Greenstone Belts. Oxford: Oxford University Press, 1997: 35-37.